Van rams through tourist hotspot in Barcelona, killing 13. Police confirm incident was act of terror. A van rammed through a crowd of pedestrians in a popular tourist hotspot in Barcelona, Spain Thursday afternoon, leaving at least 13 people killed and dozens more injured. Local police have confirmed the incident was in fact an act of terror. 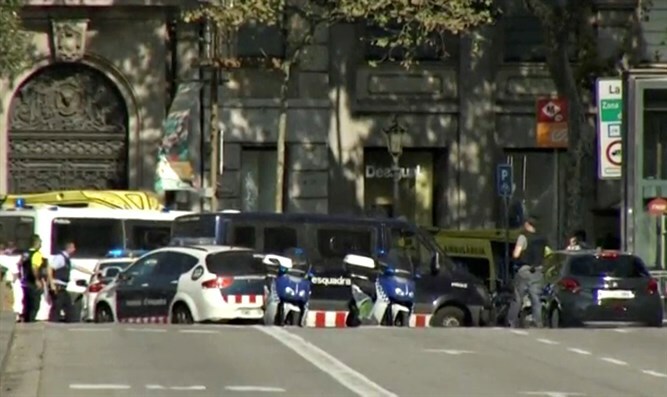 The attack occurred near the La Rambla pedestrian mall in Barcelona when a white van pulled up onto the sidewalk and ran down a number of people waiting to cross at an intersection. At least 13 people were killed, the Spanish Interior Ministry said, with another 80 injured. After slamming into the crowd of pedestrians, the driver reportedly exited the vehicle and fled the scene on foot. Police say the Fiat van used in the attack was leased to a man named Driss Oukabir or Driss Oukabir Soprano, 28, but have yet to confirm whether he was the driver during the ramming attack, RTVE reports. Authorities say that a passport of a Spanish national with an Arabic surname was found in the van. It is not clear whether the passport belonged to Oukabir. According to his Facebook account, Oukabir lives in Ripoll, Spain, but previously lived in Marseille, France. Witnesses say Oukabir was arrested near the scene of the attack, though police have not confirmed this. There have been unconfirmed reports of gunshots at the scene of the incident, The Sun reported. The attack took place near two kosher restaurants; Maccabi, and Maoz Falafel. Police ordered Maccabi closed as a security precaution after the incident. "It was quite terrifying,” one witness told Sky News. “All of a sudden scores of people ran towards us, hysterical, children hysterical… first of all they said someone had been shot. All of a sudden a second wave of people came down the street, we just ran, I lost my husband in the melee. The shops went into lockdown mode." "We really had no idea what was going on other than that we needed to get ourselves out of there very quickly... there was just hundreds of people running away very quickly." After the ramming attack, a number of armed men took hostages near the scene of the initial incident, The Independent reported. But local police have denied any hostages were taken, and say reports that two armed men were holed up in a nearby restaurant are false.